Newspaper reporter Maddie Forester once had a hot affair with Marine major Ryan Cavanaugh. But that was months ago, and Ryan wants nothing to do with her now. When they meet up by accident in Hawaii, they find out their affair isn't quite as final as either of them thought. It's still red-hot and sizzling! A (very) short story from USA Today bestselling author Lynn Raye Harris! Can Ryan ever forgive Maddie for her betrayal? Will Maddie ever win her Marine's heart, or is it hopeless? Major Ryan Cavanaugh is a former Marine, Maddie Forester is the reporter that ruined his career. When Maddie came to the war zone where Ryan was fighting, she was there for a story, although it wasn't the one she told Ryan about. Instead she published a different story, one that told lies about him and the Marine's he was in charge of. Meeting in Hawaii was something they never expected to happen, Maddie is there for a story with her boss/maybe boyfriend, Ryan is there as a get away from his life. Running into Maddie has brought back the feeling he had for her and also the hurt he had for what she had done. Maddie feels guilty about the story she wrote, her boss wouldn't pull the story even though the facts were not entirely true. Maddie and Ryan had something, something passionate but lies, secrets and distance put the odds against them. 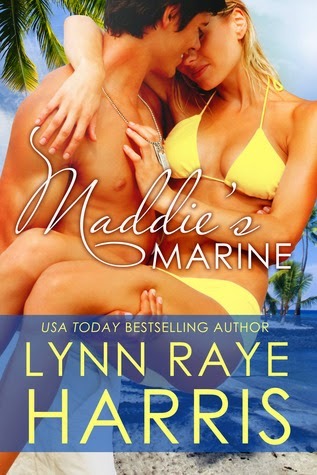 Maddie's Marine is funny and complicated all at the same time, making it a great short story to read. With its strong and passionate characters, you will find yourself reading the last line before you even realise it. If I had to sum this book up in one word, it would be Tempting.